Our students need to see the complementary relationship between the Word and the Spirit and to understand the proper function of sermon mechanics and sermon dynamics for preaching. They need to have as much zeal for the theological realities as they do for the dependence on the Holy Spirit (15). He states this because the previous generations of homiletics professors and their works only offer a “passing reference to the Spirit” (11). In this volume, Heisler admirably makes the case in how the Holy Spirit must not be an afterthought in sermon preparation and delivery, but he must stand in the forefront in every step of the process of constructing a sermon as well as a holy life. I imagine the Holy Spirit’s power touching down on the tracks of the biblical text, and suddenly the combination of Word and Spirit together ignite into sermonic propulsion. The preacher’s responsibility is not to push the train in his own strength; nor it is the preacher’s responsibility to build new tracks to new places. The preacher’s responsibility is to keep the train on the tracks (19)! Preachers would do well to internalize this concept and embrace this powerful picture. Heisler rightly reinforces the complementary relationship between the Scriptures and the Spirit in Chapter Five. Given the problematic theology of the charismatic movement who puts the Spirit and the Word against one another, Heisler gives a strong argument demonstrating the harmony between the two. Together Word and Spirit form the powerful catalyst that serves as the theological foundation for Spirit-led preaching. The Word activates the Spirit, and the Spirit authenticates the Word. The Word is the instrument of the Spirit, and the Spirit is the implement of the Word. The Word is the written witness, and the Spirit is the inward witness. In terms of preaching, the Word is the source and substance of our preaching, and the Spirit is the supernatural power of our preaching (62). He rightly notes how the three testimonies of preaching (Scripture, the Spirit, and the Preacher) come together toward a Christological witness. “The Spirit’s ministry is a continuation of Jesus’ ministry, as the Spirit stands in place of Jesus until Christ’s triumphant return” (57). Heisler is correct when he says that preaching which claims to be Spirit-filled and Spirit-led but fails to preach Christ-centered sermons are not Spirit-led sermons. I believe that the passion and confidence the prophet of God experiences in his preaching ministry are directly proportional to the daily obedience and surrender to the call of God on the preacher’s life. . . . It’s as if God has subpoenaed us to stand before him, not in a courtroom in front of a jury but in a pulpit in from of his people. We are there by divine calling, and we are there by divine authority (72). Heisler sounds a clarion call for ministers to incorporate the Spirit into their personal lives before they attempt to incorporate him into areas of their professional lives such as preparation, presentation, and delivery. Personal obedience to Christ and preaching the Word of Christ must coincide. Expository preaching is the Spirit-empowered proclamation of biblical trust derived from the illuminating guidance of the Holy Spirit by means of a verse-by-verse exposition of the Spirit-inspired text, with a view to applying the text by means of the convicting power of the Holy Spirit, first to the preacher’s heart, and then to the hearts of those who hear, culminating in an authentic and powerful witness to the living Word, Jesus Christ, and obedient, Spirit-filled living (21). While the construct of this definition reminds one of the Greek sentence construct of the Apostle Paul (see Ephesians 1:3-14), this structure does not allow for the reader to absorb the definition easily. Breaking this sentence down into two, three, even four sentences would be helpful. His vision of teaching homiletics commits the same faux pas — to which he readily admits (75). Even so, this reviewer plans on using this book as a textbook in training expository preachers in his local church setting. The evangelical world in general and preachers specifically should be grateful to Greg Heisler for re-introducing the Spirit to expository preaching. Along with this volume, Arturo G. Azurdia’s book on Spirit-Empowered Preaching serves as an excellent compliment. Praise God for raising up Spirit-led preachers in our present age. Heisler, Greg. Spirit-Led Preaching: The Holy Spirit’s Role in Sermon Preparation and Delivery. Nashville: Broadman & Holman Publishing Group, 2007. 156 pp. $17.99. This is the last stage for this morning, but must be an ongoing stage in our Christian lives. I have heard it said that with a Christian family, sorrows are cut in half and joys are doubled. Getting back to the beginning of this — don’t you believe that Mary and Elizabeth helped strengthen one another by sharing this joy with one another? They both had received incredible and yet terrifying news of what was to happen. Yet you know that they encouraged one another to persevere and by sharing that joy, they shared Jesus with each other as well. We here at Boone’s Creek had better make sure we are creating an atmosphere of joy in Christ — not based on circumstances or the amount of money in the general fund or on outreach and missions and discipleship and fellowship ministries taking place. We had better not place our joy in circumstances but in our Lord and Savior. After hearing some folks talk about some things, something occurred to me about our churches. We lament and are concerned and shake our heads at some of our young people who grow in up our churches, only to leave our churches when they get in college. Why is that? We tend to give excuses such as lack of time, social temptations, or any number of issues. Bless those who persecute you; bless and do not curse them. Rejoice with those who rejoice, weep with those who weep. Live in harmony with one another. Do not be haughty, but associate with the lowly. Never be conceited. Repay no one evil for evil, but give thought to do what is honorable in the sight of all. This looks like Mick CHUCKabee to me! One you seize the joy (that is, Jesus! ), and once you center the joy (putting Jesus and His Kingdom first), then you must baton down the hatches and secure the joy. Why? Because there will always be something or someone that comes along to try to steal the joy you have in Jesus. Why is this? Why would this happen? Our culture hates the fact that Jesus is seen as the only Savior. And in fact, I will go so far to say that they absolutely hate the grace of God that He offers. Let me tell you why — one word — PRIDE. Is there nothing he could ask of us? No, nothing. Mary understood as did all of those through church history who understood this from 1 Peter and James: James 4:6 “God opposes the proud, but gives grace to the humble.” Many who call themselves Christians are not humble at all — when they are saved, they live their lives as if the way to be a solid Christian is to read the Bible, pray, go to church, and simply do good ‘spiritual things.’ What happens is, we begin to think we are better than other people because we do these things and hold it over their heads by showing them our checked off checklist. What do we do? We become aware of the people and circumstances that surround us and run to our soul anchor, Jesus Christ, in order to stay disciplined, steady, and focused on him and him alone. Baton down the hatches! Secure the joy! Stay faithful! Don’t let the thorns of this world choke the joy! From the GOP Debate: Do You Believe the Bible? Once you seize this joy found in Christ and His Word, you must center this joy. You must put this joy front and center and let nothing transplant this. Easier said than done, I know. It takes effort and sacrifice. Yet, some want all the benefits and the blessings that come with Christ without wanting to pay the price and sacrifice. My dad always told me, “There’s nothing worth having that’s not worth working for.” In centering this joy found in all that Christ is and all that He brings, we must make a decided effort in this task. 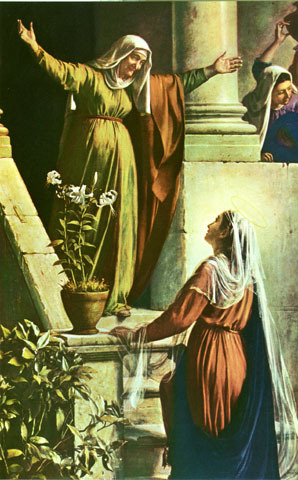 Look with me at Luke 1:39-40: “In those days Mary arose and went with haste into the hill country, to a town in Judah, and she entered the house of Zechariah and greeted Elizabeth.” Why did Mary move in haste? She heard not only about what God was going to do in and through her, but she also heard about what God had already done in Elizabeth! This was not a day trip. This “city of Judah” was around 80-100 miles away. Who knows if she even told her parents where she was going! But she had to go and see what God was doing. Remember, Elizabeth was six months along and showing. I’m sure she was a sight to behold. Though aged, I’m sure she was aglow as any new mother would be. Listen to me carefully: the only way one can have their joy centered is through the work of the Holy Spirit. Some denominations believe that we should pursue the Holy Spirit because of all the gifts he gives and all the blessings he bestows — and soon we begin seeking the blessings more than we do the one who blesses. Yet, I must tell you that the purpose of the Holy Spirit is to point people to Jesus. And the Spirit is all over here. Notice a few things. 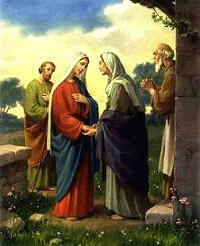 First, did you notice that Mary did not give any explanation as to her arrival? All the Scripture says was that she merely greeted Elizabeth. Yet, when Mary said this, the baby leaped in her womb! Don’t you dare tell me that’s not a viable life in there. Don’t tell me that there is nothing going on in that womb — or in any other womb for that matter. That child was receptive to the Holy Spirit (Luke 1:30) and could respond! And remember what that child was supposed to do — point to Christ! Already, he was fulfilling his purpose — joy in Christ! I know when Theophilus heard this, he likely marveled. “You mean God could speak and use a woman in this way as well?” Don’t miss that! Don’t just call this women’s intuition — this is the Spirit of God speaking through this blessed woman! The Spirit revealed that Mary and her Child were blessed — and that she was the mother of this human Jesus coming into the world. And she recognized that God had strengthened Mary for obedience in believing what the world would say was absolutely preposterous. Do our situations, circumstances, or even our friends and family take center stage when we consider God’s will for our lives? Do customs and traditions in our culture — even in our churches — take precedence over the path God has for us? Tomorrow, we shall look at how we secure the joy in the midst of those who try to steal our joy in Jesus. A conference at a Presbyterian church in Omaha. People were given helium filled balloons and told to release them at some point in the service when they felt like expressing the joy in their hearts. Since they were Presbyterians, they weren’t free to say “Hallelujah, Praise the Lord.” All through the service balloons ascended, but when it was over 1/3 of the balloons were unreleased. The issue of joy is nothing new to Christians — at least in theory. From Psalm 100 which says, “Make a joyful noise to the Lord, all the earth! Serve the Lord with gladness! Come into his presence with singing!” (Psalm 100:1-2, ESV) to when the Apostle Paul exhorts the Philippian church to “Rejoice in the LORD always — and again I say REJOICE!” Even when Paul lists the fruit of the Spirit, joy is nestled in as the second on the list right behind love. 1 a: the emotion evoked by well-being, success, or good fortune or by the prospect of possessing what one desires : delight b: the expression or exhibition of such emotion : gaiety2: a state of happiness or felicity : bliss3: a source or cause of delight. That’s a very interesting definition, isn’t it? If joy is a command of God all through the Scriptures, and it erupts from the “prospect of possessing what one desires” and is a “source or cause of delight,” how come we find so little expressed joy among God’s people? Now when I say this to you, what do you think? There is really no shortage of people out in our culture, on our TVs, on the Internet, and in our bookstores (even Christian ones) telling you what you should do to bring yourself joy. Some write books to tell you that once you discover your true purpose in life, then you will live a life of happiness and joy. The majority of our books that are out now under the banner of Christianity would make you believe that if you see yourself in a better light then God will bless you. Some will even say that if you smile, put yourself last, and live a life of excellence, think positively about yourself. Others believe that joy is simply an emotion to be found. Some Christians live their lives this way — going from one emotional experience to another (and from one church to another) hunting for the next spiritual high — making them more interested in the spiritual experience than being a committed follower of Christ. So is joy simply finding your purpose in life so you can live your dreams and feel better about yourself? Is joy simply an emotional to be had? Or is it more? We love rankings, don’t we? Every Monday morning, sports fans clamor to the Internet or to the newspapers to see if their favorite team is ranked, and if so how far up are they? And on occasion, TV Guide ranks the best TV shows in history from no. 100 to no. 1. People Magazine each year has the Sexiest Man Alive issue. We love to see who is the first and the best. If we were to do that amongst the women of the Bible, the list would be tremendous. Eve in the Garden of Eden, Sarah, Samuel’s mother Hannah, Ruth — so many would qualify. But the one who stands above all the rest is the one on whom we will speak this morning — Mary, the wife of Joseph and the mother of Jesus. We hear a wonderful song by Buddy Greene sung around Christmastime called, “Mary, Did You Know?” The song asks Mary whether she know about all that the Christ-child would endure. But I wonder if Mary had any idea about how so many would elevate her to such heights of honor, veneration, and even worship!! According to a Catholic News article, Pope John Paul II devoted his entire pontificate to her and even had the letter “M” embroidered on his garments. When he was shot in 1981 and his life hung in the balance, he kept saying over and over again “Madonna, Madonna, Madonna!” Not “God,” not “Oh, Lord Jesus.” He spoke of Mary’s name perpetually! I place everything into her hands so that with the love of a mother she will present it to her son. I also entrust my future to her. With that, many follow the Pope’s lead, who in turn was following what other Popes had canonized into Sacred Law. But where is the Scriptural support? There is none! Mary is only mentioned a few times in the Gospels and none at all after Acts 1. But the Scriptures tell us a number of things about Mary that are incredible examples for us in our daily walk. Understand, some exalt her to a far higher plane than warranted — but too often we Baptists lower her in reaction to Roman Catholic views. Let’s give her the due that Scripture does and see what it says about Mary and what it says to us even now. 1. Mary, did you know they would tell you that you were without sin? According to their view, she received the same safe-keeping as Christ did from that original sin — otherwise, Christ could not be born without sin. But the fact is that not only does Scripture not support this (even from the Catholic encyclopedia, it states: “No direct or categorical and stringent proof of the dogma can be brought forward from Scripture”,) not even Mary supports this! She sees that she is in need of a Savior. Verses 46-47 tell us: “My soul magnifies the Lord, and my spirit rejoices in God my Savior.” The way one seeks out godly humility is to look full-face toward God and see Him for who He truly is — and it is then you will see yourself for who you truly are.” Mary exalted the Lord God above all things in her heart — even in the most trying of circumstances. For example: earlier in the chapter, the angel Gabriel approached Mary saying “Greetings, O favored one, the Lord is with you! . . . Do not be afraid, Mary, for you have found favor with God. And behold, you will conceive in your womb and bear a son, and you shall call his name Jesus. He will be great and will be called the Son of the Most High. And the Lord God will give to him the throne of his father David, and he will reign over the house of Jacob forever, and of his kingdom there will be no end” (Luke 1:28, 30-33). She inquires as to how this will be — since she has never known a man! When the angel explains that God will implant a seed, she responds, “Behold, I am the servant of the Lord; let it be to me according to your word.” She submitted to God because she saw Him for who He was: ‘her savior’ (v. 47), ‘mighty’ (v. 49), and ‘holy’ (v. 49) — for starters! Where is this found in Scripture? Nowhere. Scripture clearly states that there were times when even the Lord Jesus rebuked either His mother or those who tried to exalt her above her rightful place. In Luke 11:27-28, we see a woman coming up to Jesus and saying, “Blessed is the womb that bore you, and the breasts at which you nursed!” But he said, “Blessed rather [‘on the contrary,’ NASB] are those who hear the word of God and keep it!” So here we see someone granting a blessing toward Mary — clearly trying to compliment Mary for her role in raising such a fine boy! But Jesus immediately corrected her by saying there is something greater to bless — those who hear the word of God and keep it! Note that the only one ever born who was without the stain of original sin was the Lord Jesus Christ (2 Corinthians 5:21). Mary understood that she needed a Savior — but she also knew the God who would save and she rejoiced that God would favor her in being the vessel through which Christ would come? 2. Mary, did you know they would tell you that you could help redeem sinners? Hail Maria, full of grace, the Lord is with thee! Blessed art thou among women and blessed is Jesus, the fruit of thy womb. Holy Maria, Mother of God, pray for us sinners now and in the hour of our death! There are so many issues with this: calling her ‘holy,’ the ‘Mother of God,’ etc. But primarily, the problem is that this is a prayer to Mary! Do we see this? This is a prayer addressed to someone other than God. We call it a prayer because we know from Mary’s faith and trust in Christ that she is in heaven. So this song calls on someone in heaven other than God to hear their prayer and take their prayers to God. This is called intercession. Is this supported by Scripture? Not hardly! First Timothy 2:5 states, “There is but one God and one mediator between God and man, the man Christ Jesus.” Jesus Christ is the only and exclusive intercessor in heaven between us and God. He is our sole mediator — and He is quite sufficient for the task. We need none other. But we also notice the thrust of the prayer: “Pray for us sinners now and in the hour of our death!” Many believe with all their hearts that Mary brings some sort of salvation. Even recent pronouncements by Popes give credence to this. Rightly, therefore, the Fathers see Mary not merely as passively engaged by God, but as freely cooperating in the work of man’s salvation through faith and obedience. For as St. Irenaeus says, she being obedient, became the cause of salvation for herself and for the whole human race. Having suffered for the Church, Mary deserved to become the Mother of all the disciples of her Son, the Mother of their unity…In fact Mary’s role as Co-redemptrix did not cease with the glorification of her Son. Mary … co-operated during the event itself and in the role of mother; thus her co-operation embraces the whole of Christ’s saving work. She alone was associated in this way with the redemptive sacrifice that merited the salvation of all mankind. In union with Christ and in submission to him, she collaborated in obtaining the grace of salvation for all humanity. They are so fixated on her that they believe even her image brings some measure of grace. For instance, in November 2004, a stale grilled-cheese sandwich sold for $28,000 on eBay. The owner kept this sandwich sealed up for 10 years — keeping it with her even when she went to Vegas and felt the powers from it help her win $70,000 at the tables. She made it clear to the bidders on eBay that this item was not intended for consumption. But we hear of these ‘sightings’ all the time and hear of how people set up makeshift shrines in her honor. Clearly, people believe that she has some power to either save or to have great influence on her Son to save those who call upon her. What does Scripture (and, yes, Mary) say? In verse 50, she says, “And his mercy is for those who fear him from generation to generation” (italics mine). Now, before we take issue with those who call on someone else other than Christ to save them, it should be told that many around this world are trusting in something else other than Christ to save them. It doesn’t have to be Mary, but it can be your good works, your money and contributions to the church and other charitable organizations. Martin Luther was right: “The life of Christianity consists of possessive pronouns. It is one thing to say, ‘Christ is a Saviour; it is quite another thing to say, ‘He is my Saviour and my Lord.’ The devil can say the first; the true Christian alone can say the second.” This is what Mary did — directing all the attention to the Lord. 3. Church, do we know what made Mary so highly favored? Sure, some take Mary too far in their devotion to her! But let us make sure we do not dismiss her in reaction! She is the most blessed among women and her example endures. What about you? Will you learn the lesson that Mary teaches about humility, obedience, prayer, praise, and the fact that God looks upon all of us for salvation? That is something that Mary would say, “Yes, I did know — and to God alone be the glory!